Connect and meet one-on-one with Fortune corporations and governments to pursue contracting relationships at the largest procurement conference for Asian American and minority businesses. From the CPO Forum to the Prescheduled One-on-One Matchmaking Meetings, CelebrAsian provides you with endless opportunities to network with fellow attendees and get exposed to new ideas. CelebrAsian provides intensive educational programming and extensive networking opportunities. Asian American businesses, corporate executives, and government decision-makers connect with each other on a variety of issues including contracting needs, business innovation, proven success strategies, and timely global business topics. We also take time to celebrate the many successes of Asian American and minority businesses, outstanding individuals, and our next generation of exceptional leaders. 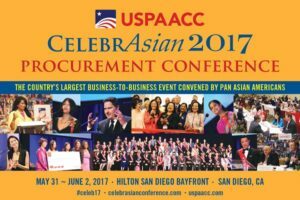 Be a part of the largest and oldest procurement conference for Asian American businesses in the US. CelebrAsian connects Fortune corporations and governments with Asian American and minority businesses to pursue contracting relationships. For more information, please contact Diana Yee at (202) 378-1121, diana@uspaacc.com. Hospitality1 is proudly involved in hospitality industry events across the US.